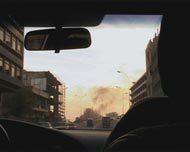 Returning to Iraq in February 2004 after a 35-year absence, Pachachi shows an almost sedate, dignified country attempting to rebuild in the face of an obstinate, largely unhelpful occupying force. Part tract on the perilous living standards of contemporary Iraq and part chronicle of the torturous slowness her father Adnan and others experience as they author the country's constitution, Return works best as a document of Pachachi's memory. As she revisits the formative people and places of her childhood, Pachachi achieves vérité lyricism, illuminating a host of lives shattered by both a ruthless dictator and the Western hegemony that replaced him—proving that the subdued, steady accumulation of facts and imagery is far more damning than any sound and fury. 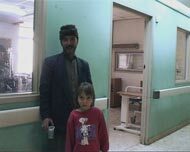 In February 2004 London-based director, Maysoon Pachachi, went back home to Baghdad for the first time in 35 years. 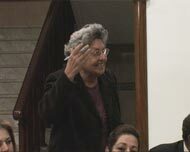 She filmed continuously for 5 weeks, talking to all sorts of people about their aspirations and fears for the future, the difficulties of the present and the burdens of the past; children, women activists, teachers, doctors, patients, ex-prisoners of the old regime, but also more recently of the US occupation, shopkeepers and artisans, the victims of looting and people forced to become smugglers during the time of sanctions. There were painful, inter-generational conversations, angry reactions to a massive suicide bombing, discussions of corruption and the country’s economic future, and considerations of Iraqi identity in the light of history. At the centre of the film is also the director’s 80-year old father, back after a long exile to see if he can help in any way in the limited time he has left. During the filming period, he headed a committee drafting a temporary constitution and bill of rights and the film follows the tortuous process with its arguments over wording changes demanded by Washington or compromises to satisfy sectarian interests. The film moves continually between these two spheres: the formal political process and daily life ‘out on the street’; in markets, hospitals, schools, at demonstrations and historic sites, in people’s houses, and in cars. The film is also a personal exploration of the director’s own feelings about coming ’home’, about memory and identity. In the end, it is also a film of a daughter looking at her father as he moves towards the end of his life. Since filming, the country has descended and continues to descend further into extreme violence, chaos and economic disarray. 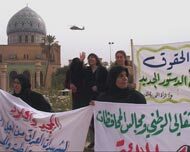 This film makes a space for the voice of Iraqis at this extraordinary time in their history and offers a glimpse of their endless everyday resilience as they struggle to sustain their lives and fight off a sense of despair.